Narrator: Speakers, publishers, consultants, coaches and infomarketers unite. The Speaking of Wealth Show is your roadmap to success and significance. Learn the latest tools, technologies and tactics to get more bookings, sell more products and attract more clients. If you’re looking to increase your direct response sales, create a big time personal brand and become the go-to guru, the Speaking of Wealth Show is for you. Here’s your host, Jason Hartman. 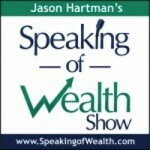 Jason Hartman: Welcome to the Speaking of Wealth Show. This is your host Jason Hartman where we discuss profit strategies for speakers, publishers, authors, consultants, coaches, infomarketers, and just go over a whole bunch of exciting things that you can use to increase your business, to make your business more successful and more and more passive and more and more automated and more and more scalable. So we will be back with a great interview. Be sure to visit us at SpeakingofWealth.com. You can take advantage of our blog, subscribe to the RSS feed and many other resources for free at SpeakingofWealth.com. And we will be back with a great interview for you in less than 60 seconds. Narrator: Have you listened to the Creating Wealth series? I mean from the beginning. If not, you can go ahead and get book 1, that’s shows 1 through 20, in digital download. These are advanced strategies for wealth creation. For more information, go to JasonHartman.com. Jason Hartman: It’s my pleasure to welcome Alan Levy to the show. He is President and CEO of Cinchcast which is an innovative could-based solution for virtual events, webcasts and conference calls. And he is also the founder and CEO of one that you’ve definitely heard of, Blog Talk Radio, and that’s the largest online talk radio network. So it’s a pleasure to have him coming to us from New Jersey today. Alan, how are you? Alan Levy: Good morning. How are you? Jason Hartman: Fine, thanks. Well, hey, great pleasure to have you on. First of all, let’s talk about Blog Talk Radio and give us a little history as to how it came about and when it came about. Alan Levy: Sure. It’d be my pleasure. Blog Talk Radio was a platform that we created in the fall of 2006. And the way it started, my background’s telecommunications. I was in the film business for a number of years in the mid-90s to late-90s and so on. And my dad had Non-Hodgkin’s lymphoma in early part of 2000. In March of ’06 he got it for the third time and I decided to create a blog for him. And I didn’t know much about blogging – I didn’t know anything in fact about blogging, social media, podcasting or the like. So I just created a blog and I kept seeing the words “join the conversation” and, to me, bloggers felt like talk radio hosts. There were, first of all, millions of them unlike radio. But they were creating conversations. And I kept seeing the words “join the conversation”, no conversation I could hear, so I said wouldn’t it be interesting to enable bloggers, companies, associations, anyone to really pick up a phone and create a live radio show streamed and then that show would be recorded after. In fact, I didn’t know what a podcast was but we certainly have learned. And that’s how Blog Talk Radio was started. So, today, five years later – setting on 6 – Blog Talk Radio, we’ve hosted over 2 million radio shows which are in fact podcasts. And we host 1500 hours of new content every day on the Blog Talk Radio Network and have thousands and thousands of radio hosts. Jason Hartman: So with Blog Talk Radio, contrast and compare some of the differences between that and podcasting. I mean it doesn’t use an RSS feed, right? Alan Levy: Yes, it does. Jason Hartman: Oh, it does? Alan Levy: It uses an RSS feed. It’s totally integrated into iTunes with one click. The fundamental difference between Blog Talk Radio and podcasting is the way the content is created – the way that audio content is created. When I got into this, podcasting – and really today mostly – podcasts are done using an mp3 recorder, digital recorder, it’s Skyped, it’s somewhat of a jumbled process and it’s a complicated process. And it’s not that easy and sometimes it’d be a bit expensive as well. What we’ve said is why not use the phone? And the phone is the medium to enable all these conversations to take place in a live format if you so desire where you could request people calling in and ask questions. And then once that conversation is done, it’s automatically recorded and then it can be edited and then it’s published as a podcast complete with an RSS feed. So what we’ve done is simplified the entire process from creating that content all the way through to the distribution. Jason Hartman: Okay. So, in other words, with podcasting people usually think well I’ve got to go out and get some equipment first. And Blog Talk Radio is like a simpler platform because they basically pick up the phone, they probably dial in a number and that’s where people meet and that’s basically like a conference call that’s streamed and recorded. Would that be a correct analysis? Alan Levy: Yes. And you could use a mobile phone. You could use Skype. You can use any type of landline. And yes, a host would have their own number. You would be offering another guest line, a phone number to your audience or a guest. You could dial off the studio that’s built into the cloud – it’s a virtual studio, there’s no downloads. But you can do some other things like play some audio clips. So you can have three roles. You can play an ad, you can play a pre-recorded message back to your audience. So it’s a much different level of engagement, one that we feel is more engaging in many ways. So that’s what Blog Talk Radio is. And, in fact, as you said right, it is actually a conference bridge on steroids. And that’s really how the genesis of Cinchcast is really enabling us to go after the enterprise space as we couple the technology that’s powered Blog Talk Radio to now focus on Enterprise and online publishers. Jason Hartman: Generally speaking, with Blog Talk Radio, are the shows live or can podcasters use it as just a way to expand their audience because podcasters are used to not being live and recording, posting, and boom the shows go out and they’re picked up. But I mean there are more listeners just on that platform of Blog Talk Radio, right? But then it’s also syndicated to iTunes as well? Maybe fair that up for us if you would. Alan Levy: Yeah. I mean we have more than 12 million listeners a month to the overall network. Our platform is fully integrated into Google. We have a very high page ranking. So if you’re a host on Blog Talk Radio it’s gonna rank nicely for you. Yes, most of the shows are streamed live. You’re notified – your audience, we’ve integrated with Open Graph in Facebook and of course all the social tools. So your audience is joining you, but many of our hosts are using our tool to connect – like this interview could be used using our tool and not displayed, not published live, but recorded, edited and then published when you wanted – when it’s complete – and then published out on demand. So we are a live platform and enabling platform, but also a very large distribution platform and we also leverage third party podcasting platforms via RSS feeds or iTunes. If you search “Blog Talk Radio” on iTunes you’ll see hundreds and hundreds if not thousands of radio hosts that have their content automatically picked up in iTunes. So we’ve simplified the entire process. Jason Hartman: That’s great. Yeah, that’s fantastic. Now, explain the revenue model for the company if you would. I know that there’s a charge for the talk show host if you will. And there are some different plans there. But are there other revenue models as well? Alan Levy: Yes. So we do have a free model. So anyone can come on and they could use the platform. And we have I think a robust free model. We have a selection of plans, as you noted, which gives you certain abilities to screen callers for example. You Skype, be able to stream during primetime and with the audiences. At any given point, by the way, we’re hosting 250 simultaneous radio shows. And that’s usually in primetime. So we have a selection of those types of plans but we also have an ad model and as we’ve gotten larger and larger, we have a tremendous amount of content and audiences that are interested in sports and politics, so we do have a rev share program with our hosts where they participate in the revenue that’s generated from the content that’s being created that they’re creating and publishing through the Blog Talk Radio platform. So it’s both an ad model as well as a premium subscription model. Jason Hartman: Great, good stuff. Well, what else would you like people to know about Blog Talk Radio before we move on to talking about Cinchcast, your newer venture? Alan Levy: Well, I think what’s really a thing about Blog Talk Radio, and I’ve seen this for years now, is we’ve built the radio network and it’s built by hosts, thousands and thousands of them. And basically it’s an enabling and empowerment platform as opposed to just a distribution platform. When you can create content very easily, you can become a leader in your industry, in your space. And the ability to bring on guests, it’s very easily notable. So we’ve had Brad Pitt and Obama, every major author – it’s very popular among authors – and I think for individuals that are looking to create their own brands, promote their brands and create content and engage in content in an easy way, I think the platform would be at least worth a look at. So that’s what I would say. And we welcome anyone who comes by and either listens to content or gives the platform a whirl. Jason Hartman: Well, actually, that leads me to another question, Alan. What suggestions do you have for aspiring show hosts in terms of topic selection or interview format or anything you might suggest to make their shows more popular, even ways to advertise and get the word out about one show. Alan Levy: Right. I mean, that’s a great question. And creating a radio show on blog talk radio is not like sending out a tweet, which you can just send out 140 characters. It takes a lot of effort. And the most successful hosts on Blog Talk Radio put a great deal of thought into their show. What’s the format? So, if you’re an author, you’re about sports. So that’s your target. You know your target audience, come up with a format. Maybe it’s a 20 or 30 minute show. You’re gonna interview a guest for the first 10 minutes. You’re gonna take callers. You’re gonna leverage the tools that you have, not just on Blog Talk Radio but the Facebook, the ability to create events, use Twitter to help promote the brand, your brand really and that guest. And then provide that guest with the tools that they need to promote it. We’ve had huge guests on Blog Talk Radio and they’re promoting that they’re on these shows, and athletes and actors and that’s helpful of course for the host. And I think the other thing that we feel is important in consistency. It’s a mostly on demand platform, and that’s how the content’s consumed, but there are a number of shows and hosts that get big live audiences. So you’d be consistent and you can try to be. We built it around a scheduling format. Really, it’s not like YouTube in a sense, but if you want to host a radio show at 3pm on Tuesdays, well that will give the audience the ability to follow it and subscribe to it and participate. So I think those are some of the tips I think are useful. Jason Hartman: Yeah, those are great tips. And to dovetail on your point about consistency, podcasters and information marketers are always asking me “Jason, what can I do to be different? What can I do to stand out?” And I’ll say to them – this is my answer – if you want to be different, be consistent because that’s really different. Alan Levy: Yes, that’s true. Jason Hartman: Very few people really can be really, really just incredibly consistent at anything and that’ll make you stand out, so I definitely take your point, Alan. That’s very good advice. Anything else you’d like to wrap up with on that? And then let’s talk about Cinchcast. Alan Levy: No, I think we covered it nicely. So let’s do talk about Cinchcast. Jason Hartman: Fantastic, tell us about it. Alan Levy: Yeah, so Cinchcast came about about a year and a half ago. We have many friends and organizations, online publishers that are on Blog Talk Radio. And many of them said, you know, we love the technology, we love the tools but we’d like to use it in our own environments. It’s almost like a new medium in a sense. If you think about what an online publisher like the Huffington, or Politico, or these other companies, these blogs have tremendous amount of content they’re creating, text, but this is providing them with their own radio network, the concept of a private radio network or the concept of leveraging this technology to stream to 4000 Wal-Mart general managers is appealing. And so we went on a mission to pull out the technology in Blog Talk Radio which we actually have patented. And the patent is the integration of the stream and the audio bridge in which we got patented, actually retroed, back to ’07, so we’re excited about that. But it enables a company and organization to pose a large town hall by leveraging the stream, by having interactive Q & A, by recording that and publishing that content very easily. So it’s not content that’s sitting on Blog Talk Radio and it’s not necessarily used for “content creation”. But it could be used for large conference calls because it’s an interesting dynamic in the large conference call market that’s dominated by an AT&T or Verizon or a company like Global Crossing. The larger the events are, the more expensive they are and the worse the features are. And this is an enormous market that we’re going after and focusing on. So I’ve got a group and team in marketing and product and design that’s focused on Cinchcast as well as a team that’s working on the Blog Talk Radio Network. Jason Hartman: Okay, so go to meeting or any of those types of platforms. What is the difference between a webinar platform like GoToMeeting and Cinchcast? Alan Levy: Right. There’s a number of differences. One is that we’re a browser based platform. So there’s no download plugin. Jason Hartman: Which is great by the way. I just want to give you a shout out for that. Alan Levy: Exactly, right. And it’s really important for the enterprise because many times the plugin, it’s easier and it’s a security risk. There are potential issues around that. That’s number 1. Number 2, those platforms are potentially to pull in the audio from the video feed and there’s really a challenge when you get 2 or 3 hundred in the same time. It doesn’t scale well. And our platform can accommodate thousands of people on the phone at the same time and tens of thousands streaming while they’re listening to it. So we are built on a conference bridge, at carrier-grade bridge and these other companies like the WebExes and GoToMeetings are not. They are built, they’re a void platform that doesn’t scale. In fact, WebEx themselves using an InterCall or a large conference provider when they want to do global calls because that problem just doesn’t scale. So that’s the market that we’re targeting for the large enterprise, the distributed and sales organizations, the global corporations that are spending just huge amounts of money when they really don’t need to and that’s the market that we’re looking at. So there are stark differences. Webex and GoToMeeting are great platforms, but our interface is very slick and, again, the plugin is probably one of the key areas that we’ve looked at. Jason Hartman: But you keep saying large, so this is really a large corporate application then, right? Or is there something for small entrepreneurs here? Alan Levy: It’s generally for large. I think if you’re a small entrepreneur you want to use WebEx, GoToMeeting or there are hundreds of these types of platforms that have collaboration. One thing that Cinchcast we incorporated and we’ve taken it and perhaps someday we’ll incorporated it to Blog Talk. We’ve incorporated slide sharing. So on Cinchcast, you have the ability to do other things, Blog Talk Radio you can’t. Like, for example, registration, so you can register for an event using Cinchcast and your registration will appear and your name will appear in the studio. We also, like I said, included slides. So if you want to upload a PowerPoint and take questions during that, well you can do that. So it truly is a webinar but it has the beauty and the power of the phone integration which is what these other platforms don’t have. Most times you’ll have to send in a text chat. So if you have more than 25 or 30 people that you want to do a PowerPoint or a webinar – this is a platform that will work but under that I wouldn’t recommend it. Jason Hartman: Yeah. Well, 25 or 30 isn’t that big. Alan Levy: No, it’s not that big. And potentially your audience could be and that’s at Cinchcast.com, you’ll see that the Cinchcast.com website is really a brochure cite whereas BlogTalkRadio.com is our network and that’s really a cite that’s used for both hosts as well as listeners and audience. Jason Hartman: Yeah, Alan, tell us a little bit about your story. Now, you’ve taken…Blog Talk Radio has done an IPO, is that correct? Alan Levy: No, it hasn’t. It’s a private company and both Cinchcast and Blog Talk Radio are private companies. It’s one company and it’s private. I took my prior company public in May of ’99 in the Telecom days but this company is not a public company at this time. Jason Hartman: Yeah, I was just sort of looking for some general business success tips there or kind of biographical stories. So if you had anything there, I mean you’ve obviously been very successful, people love to hear from successful people, so I just wanted to kind of close with any of your background. Alan Levy: Yeah, well sure. My background is actually I’m an accountant. Okay, so your audience may have a lot of accountants out there. In fact, I was an accountant for 14 years. I had 14 tax seasons and I thought I’d be an accountant for the rest of my life. And it’s not bad. I made a nice living and it was fine. And one of my clients in ’93 said I’m creating this telecom company and I’d like you to be the CFO. And I said, you know, I took the shot – I said let me take a shot at that. And it was a fledgling early company but we happened to raise some money and I helped coordinate that. So I learned all about financing and I ultimately became the CFO of a company that raised about $100 million dollars. I joined another company three years later – that company raised $500 million. I was president and we went public at a very big public offering and we sold the company in December ’99. So that is America’s story I guess, right? But going from the accountant – and that was just vital to my career and that just set me up well for this foray into Cinchcast and Blog Talk Radio was that background. Jason Hartman: Sure, sure. When you started Blog Talk Radio, give us sort of the startup story if you would. I mean you’re the founder, right? Was it just you exclusively? Alan Levy: No, ma’am. I have a cofounder who worked with me in the telecom days and, like I said, I came up with this idea when I created a blog for my father and learned about blogging and said, you know, hey, you want to take a shot here. And I was telling people no one had done this technology. No one had taken the phone and turned the phone into a publishing platform. And we felt we could do it and we in fact did it. It was very rudimentary of course, but it was early and we didn’t know anything about advertising, we didn’t know anything about radio, we didn’t know anything about social media or the web really. We were phone guys and that’s how we started it. And it was literally picking up the phone, emailing people, and people would come on and begin to use it and see that it really helped them. And that’s how we started and it adds a lot of value to a lot of people’s lives. Jason Hartman: And so was it you and your cofounder? Was there a garage story here? How did you fund it? Did you just fund it I assume with your own money from the other prior successes? Alan Levy: Right. So this wasn’t a garage story because I had the prior experience and actually retired when I was 40 which was nice. I was semi-retired let’s say. I took about 5 years off. I was in a position to invest and put my money where my mouth was and the we saw a nice success. After about a year we brought in outside investors. And since that time we’ve done a couple of series A and series B financing and we’ve got an incredible group of investors. And we’re really on a great track to do some big things. And so we did finance it. I am the largest shareholder. But today so many companies are bootstrapped and I applaud those companies that do it and I wish them all great success. It’s not easy and it’s a challenge. Jason Hartman: Sure isn’t. Well, very interesting story. Alan Levy, thank you so much for joining us today and keep up the good work with Blog Talk Radio and your newest venture Cinchcast and we’ll look forward to seeing more and everybody listening should check out those websites. Alan Levy: Thank you for the opportunity speaking with you.